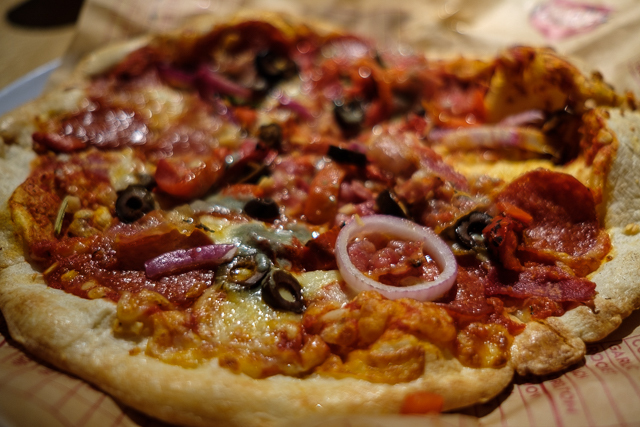 I was invited to the press night of MOD Pizza’s Coventry restaurant by Coventry bloggers. Food and drink were complimentary for review. All words and photos in this post are my own. I am a big fan of pizza, to the point where I class pizza as one of the essential food groups. So I was excited to hear about MOD Pizza opening a restaurant in Coventry. And even more so when Emily from Coventry Bloggers invited me to the press launch night. MOD Pizza started in Seattle, and has expanded across the United States and into the United Kingdom and have over four hundred restaurant. They bill themselves as “original superfast pizza experience”. I think the easiest way to explain it is like Subway for pizzas, in that you follow your pizza down the counter choosing which toppings to go on it, at no extra cost, before it is baked in their huge pizza oven and delivered to your table on a plate. A proper plate, not a board with paper underneath, that tears as you cut your pizza – other pizza restaurants take note! I like the “Subway” concept, especially for pizzas, as even when presented with a big menu I like to make changes to toppings. It reminded me of a great Italian restaurant I went to in Limassol called La Boca. The menu does have a few pizzas to use as a starting point, however I decided to freestyle as I went down the counter. I started off playing safe with a standard tomato and mozzarella base. At the meat section I was restrained, only choosing pepperoni and bacon, from the many options available. Then black olives, red onion and roasted red pepper from the vegetable section and finally a sprinkling of blue cheese to finish it off. At the end of the counter you pay for your pizza and return to your table, while your pizza goes into the huge pizza oven. One disappointment was that egg was not one of the “30+” toppings available – I love egg on pizza! My pizza only took a few minutes to arrive, but others took a lot longer – forgivable in this instance as the restaurant has not opened yet. Initially I thought my 11” pizza looked a bit small, but it turned out to be the perfect size. I was full after eating it, without feeling like I had overeaten. This was good as it is an uphill bike ride back home from the city centre. For those with smaller appetites they also do 7” pizzas, or you can get a takeaway box for any pizza you cannot finish. Not being able to carry a box while cycling home meant that I had to eat all though. I was pleased with how my pizza turned out, the blue cheese looked a bit strange once melted, but it tasted so good, especially with the bacon! Roasted red pepper is not something that I would usually choose for a pizza, but I am glad I tried it – the softer texture and slight garlic flavour worked better on a pizza than standard red pepper. We also shared some sides on our table (another reason why slightly smaller pizzas are better) – cheesy garlic pizza bread, wedges and dips. Another table ordered a humous rip and dip, which looked amazing as it was being delivered to them. The flat bread had puffed up like a balloon – definitely one to try next time! As I was on my bike and doing the late shift with Henry when I got home, I stuck to soft drinks. Usually this would mean post mix fizzy drinks, which are self service and unlimited at MOD Pizza, but there was a much more exciting option – a selection of homemade lemonades! Also on a self service and free refills basis. They only had a couple of beers on tap, so there were more lemonade options than beers. As someone who prefers driving to drinking it is great to see that some thought has gone in to the soft drinks. I found the strawberry lemonade slightly too sweet, but thought that the classic lemonade was spot on! For those that know Coventry, MOD Pizza is where the entrance to Cathedral Lanes used to be (Wilko’s now has a door at the back), behind the Lady Godiva statue. Inside it is like a lot of street food type places, with bare concrete and chipboard, but with some interesting statement art on the walls. My sort of place! It felt spacious inside, with plenty of room for pushchairs, which is something I have to consider these days! Three years ago Jen and I could eat out wherever (and whenever!) we wanted, but these days, other than the rare occasions we are child free, we have to consider pushchair and toddler friendliness. MOD Pizza ticks those boxes! There is also an outside area, which should be perfect in the summer. Now that Cathedral Lanes in full of restaurants I really hope that Broadgate states to feel a bit more European, with people eating and drinking outside restaurants. Overall I was impressed with MOD Pizza, the food was good and I liked being able to choose what went on my pizza as it was being made. I am keen to go back with Jen and the boys, I know Owen will love choosing his own pizza toppings! MOD Pizza in Coventry is opening at 12:00 today, 29th March 2019. Their first fifty customers get free pizzas and one lucky customer will win free pizza for a year!